Hello everyone! Welcome back to my continuing look at Avatar: The Last Airbender and how the relationships between the characters within it. If you missed the previous post (here) about Sokka, be sure to check it out! 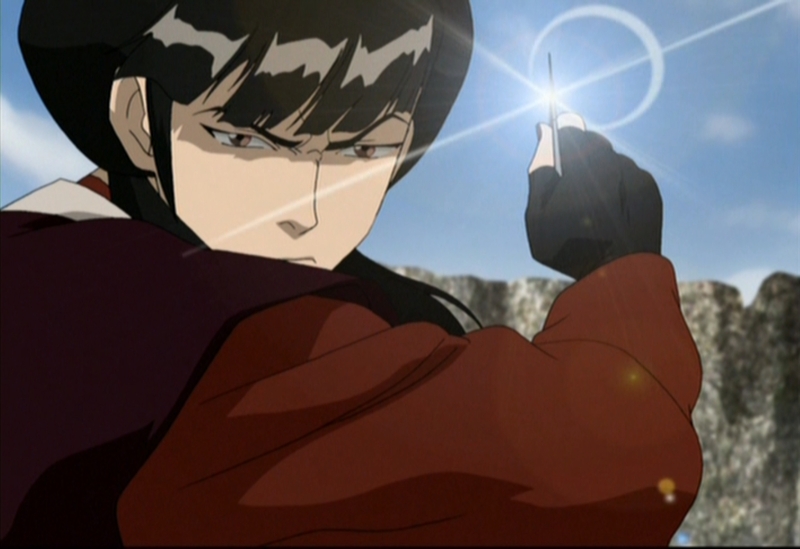 This week I’ll be discussing the relationship between arguably one of the series’s most important characters, Prince Zuko, and his knife wielding girlfriend Mai. Now as many of you have watched the show may know, Prince Zuko is a pretty integral part of the over-all Airbender plot. So much so, in fact, that if I tried to cover every detail and change in his character over the course of the series I’d have to write one HELL of a blog; with a length border-lining on a college thesis. So since I don’t really have the time for that (and I doubt many of you have the time to read it) I’m going to do things a little differently then you may expect and instead focus on Mai and her contributions to the relationship. Hopefully doing so will also help distinguish the troubles that Zuko faces as a person from the troubles that he and Mai struggle with as a couple. I will also be using WAY more pictures than I normally do. Because pictures are awesome. Zuko’s mom is pretty awesome. In fact she’s pretty much shown to be the kind of caring and kind mother that anyone would want. In one particular touching scene, Zuko throws a loaf of bread at a baby turtleduck after asking “Wanna see how Azula feeds the turtleducks?”. 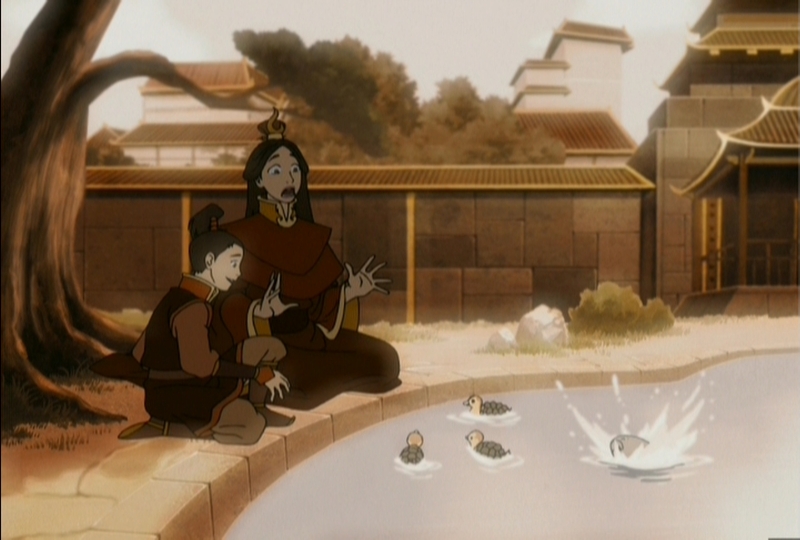 When the mother turtleduck promptly storms out of the water and bites him, Zuko’s mother gives him a lesson in just what lengths a mother will go to protect her children. It’s a touching scene that foreshadows not only Azula’s sociopathic nature, but the eventual sacrifice his mother will make to save him. After this scene we get our first glimpse of a young Mai. She’s bubbly, joyful… nah just kidding. She the quiet and shy girl you’d expect her to be. In fact the only emotion we see out of the little girl is a soft smile and a blush when she see’s Zuko walking by with his mother. Is this puppy-dog love? Perhaps. But for a girl like Mai feelings don’t come easy, and it’s easy to understand why she’d still care for Zuko many years later. After all, it’s not like he turned into some hideous, fat young prince. He’s actually quite handsome, even with his scar. But anyway, back to the children. Azula notices Mai blushing and has a wonderful idea, to cook up a game to embarrass the two of them. Yes, that’s little Azula’s idea of a fun game. So she runs up to Zuko and her mother, begs him to play, and when he says no Azula feeds her mother a lie about how they need even teams to play a game (Ty Lee was present as well) and how she wants Zuko to spend more time with her. At his mother’s behest, Zuko joins the young girls in play. Azula then has Mai stand next to a fountain, places an apple on her head, and proclaims that the point of the game is to knock it off. Which she quickly demonstrates by lighting the apple on fire. Zuko, hardly on board with this idea in the first place, immediately freaks out and rushes Mai to help knock the now burning apple off of her head. He trips (of course) and slams right into her, knock the two of them into the fountain. This elicits plenty of laughter from Azula and Ty Lee, more blushing from Mai, and a rather unhappy Zuko who storms off declaring that “Girls are crazy!”. You don’t mess with Mai. Of course things get real exciting when a group of earthbending rebels try to assassinate her family with a rock slide. But the attempt is stopped by Aang and his friends who don’t actually realize what was actually going on at the time (and are just being heroes). Of course rock slides aren’t exactly silent killers, so even with Aang’s intervention Mai and her family’s guard immediately begin looking for the culprits and spot Aang and his friends. This is when we learn just how BA Mai is. In seconds of spotting the Gaang she flicks out her wrists and sends a barrage of darts flying towards them at lightning fast speeds. Had Aang not been an airbender, I dare say his life would have ended then and there. This is also the first time we see Mai smile, as she finally has something to do other then be bored and listen to her parents complain about how mopey she is. It’s important to note this because Mai doesn’t smile often. In fact if you aren’t Zuko, and you see her smile, you are probably in trouble. 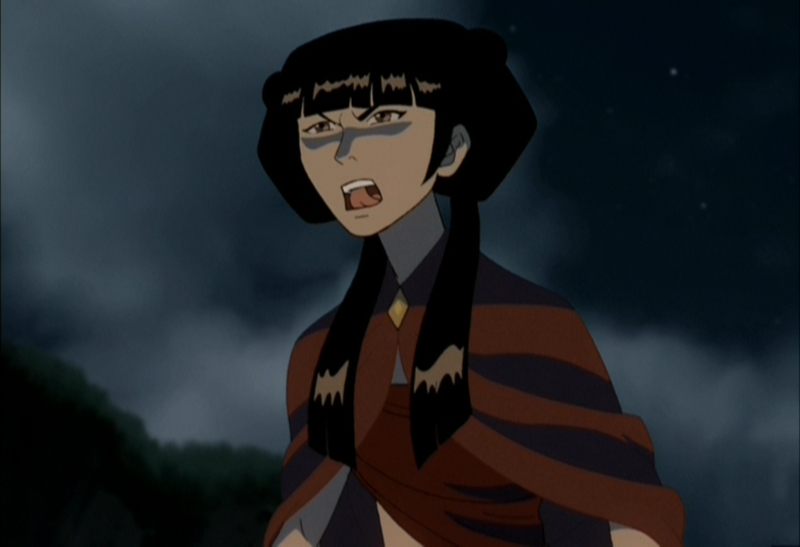 In this breif scene the creators of Avatar not only establish Mai’s personality as a perpetually bored and un-excited young woman just waiting for something interesting to happen, but also just how dangerous she is in combat. A fact that will quickly become relevant when Azula, in her hunt for her traitorous brother Zuko, comes to Omashu and recruits Mai to help her in her hunt. This eventually leads to her learning that Aang is also in town, and after a rather epic battle between the three girls and the Gaang she also decides to hunt them as well. In a particular small and forgettable moment, Ty Lee turns to Mai as the three girls are leaving town and remarks how “interesting” it’ll be for Mai to get to see Zuko again. This remark causes Mai to turn away from her friends and hide another one of her rare smiles. 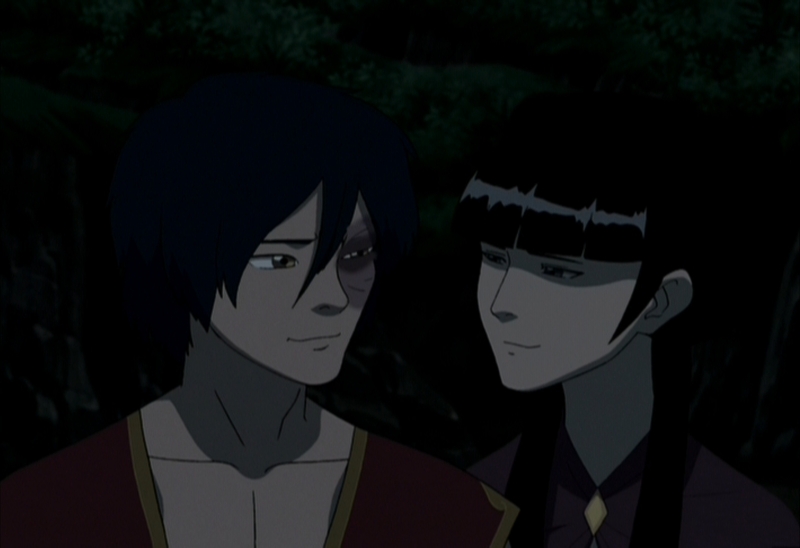 Mai may not have seen Zuko in years, but clearly she still has feelings for him. I’d like to take a moment now to discuss Ty Lee, for those of you who do not know her. Ty Lee is a world-class acrobat and the only (shown) performer of chi-blocking techniques. If you’ve been watching The Legend of Korra, you’ll be quite familiar with what the techniques can do. If not then simply put Ty Lee can disable a person’s bending (and mobility) by striking at key points on their body. This allows her, a spry and sprung young woman, to out class and defeat even the most skilled warriors or benders. Ty Lee is also something of Mai’s opposite. While Mai is universally dour and wears sarcasm like Aang wears an arrow on his head, Ty Lee has an upbeat personality, who is always smiling and believes in auras and positive energy. Despite their difference though, the two are quit close, and have known/suffered under Azula’s “friendship” together since they were little girls. Now rejoined with her childhood friends, Mai strikes off to help hunt down not only Zuko, but Aang as well. A chase that eventually causes them to bump into Suki and the Kyoshi Warriors after they had been following the trail of Aang’s flying bison Appa. Suki and her warriors are defeated, and imprisoned soon after. Now aware that the Kyoshi warriors are friends with Aang (due to how they protected and helped Appa escape) Azula files that little fact back away in her brain for later use. Don’t worry, that’ll make sense later. Now of course you’re probably wonder when Zuko is actually going to factor in to any of this. And that’s a fair point, because the truth of the matter is that his story doesn’t intersect with Mai’s until season 3. The two of them remain, essentially, two separate characters going about their own goals until the final season of the show. This is important though, because so often character in TV shows or movies are portrayed as having these kind of relationships where they cannot survive without the other. “You complete me,” that kind of stuff. When the truth of the matter is that healthy relationships are formed by two individuals who decide to share a life with each other. Sokka and Suki are good example of this, as are Katara and Aang. Zuko has his own demons to face, and Mai has her own journey to as well. The fact that the creators of Avatar were willing to have a “couple” not meet until the final season is wonderful! Lesser writers would have copped out sooner and given them some sort of secret Romeo & Juliet style “forbidden love”. And while Mai and Zuko certainly have a forbidden love at some point, it is handled with all the turmoil and ramifications that a real relationship like that would actually have. But more on that in a bit. Now remember the Kyoshi Warriors from before? Now that’s important. See, having deduced that a large, frontal assault on Ba Sing Se won’t work; Azula decides to take a more underhanded approach to breaching the city and disguises herself, Mai and Ty Lee as Kyoshi Warriors. 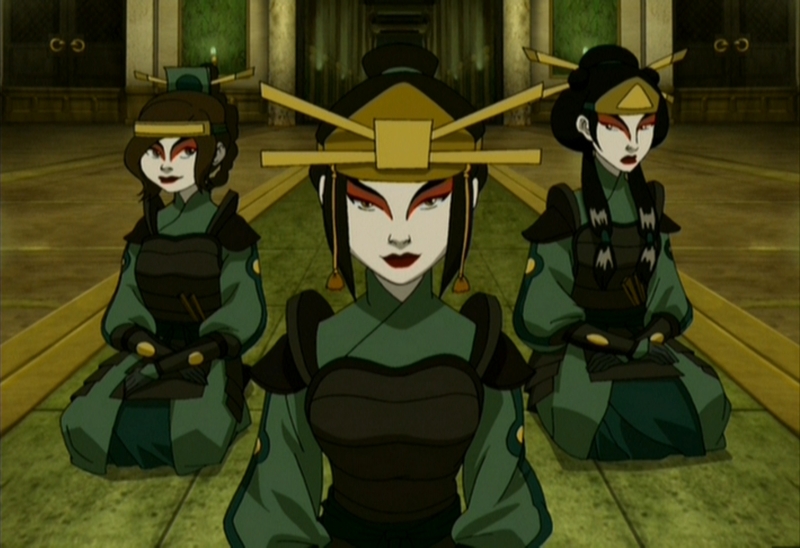 Claiming to be friends of the Avatar, and with nothing to prove otherwise, the three girls are allowed into the city and brought before the Earth King himself. Long story short, Azula stages a coup, takes control of the Earth Kingdom from the inside, and then traps/defeats/almost kills Aang in battle. Zuko is tricked/pressured to help Azula as well, and eventually chooses to help her and “reclaim” his honor for the fire nation. His uncle, Iroh, urges him not to do it and actually helps Aang and his friends escape with their lives. Zuko is now no longer a traitor of the Fire Nation, but has betrayed his Uncle by choosing his sister’s side. And during ALL of this Mai and Ty Lee were put in charge of protecting the Earth King’s bear. When Aang’s friends arrived to save him Mai simply informed them to “Take the bear” and didn’t put up a fight, having no real interest to risk her neck for the sake of some animal. With Zuko no longer a traitor and Mai’s mission to hunt the Avatar complete, the two of them FINALLY get to reunite with each other. On the way back to the Fire Nation Mai approaches Zuko and asks if he’s cold. “I’ve got a lot on my mind.” Zuko explains. “It’s been so long, over three years since I was home. I wonder what’s changed. I wonder how I’ve changed,” he ponders. Mai’s response? She just yawns and pulls herself next to him. “I just asked if you were cold. I didn’t ask for your whole life story,” she says. She then tells him to stop worrying and embraces him in an attempt to make him feel better. The two of them are then shown to be close from that point on, with Azula even remarking at one point that she’s never seen Mai happier. 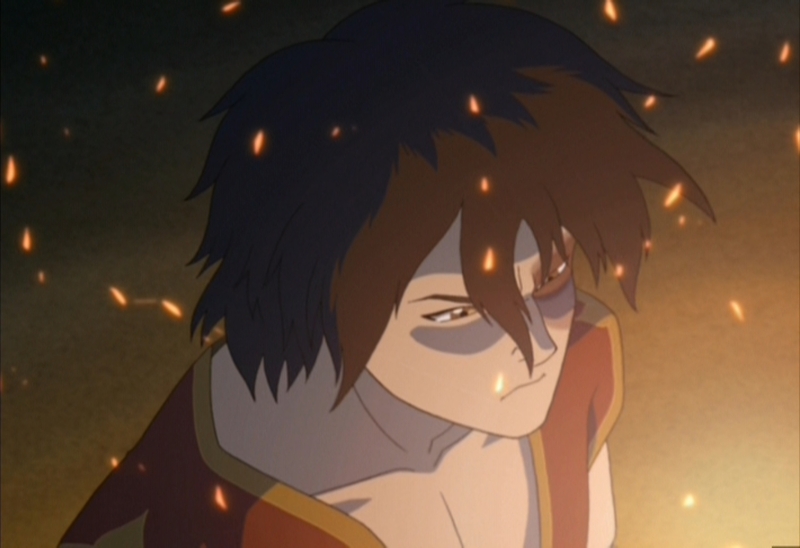 Zuko on the other hand, isn’t doing so well, and is struggling internally with whether or not he did the right thing by betraying Iroh and returning to the Fire Nation. He also suspects that Aang survived his run in with Azula back in Ba Sing Se, and does his best to hide that fact. He also sneaks out to visit Iroh in his prison, a fact that Azula eventually becomes aware of. 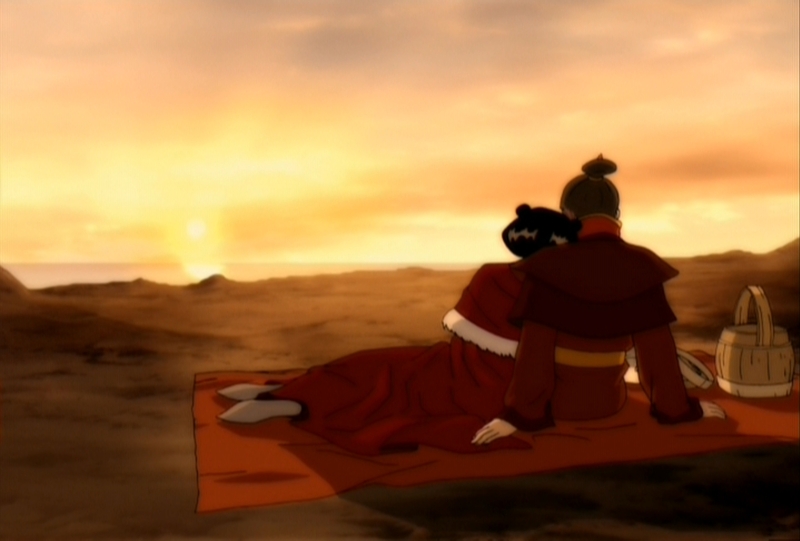 When Azula goes to confront Zuko about his visit with Iroh, she breaks up a lovely picnic between him and Mai. 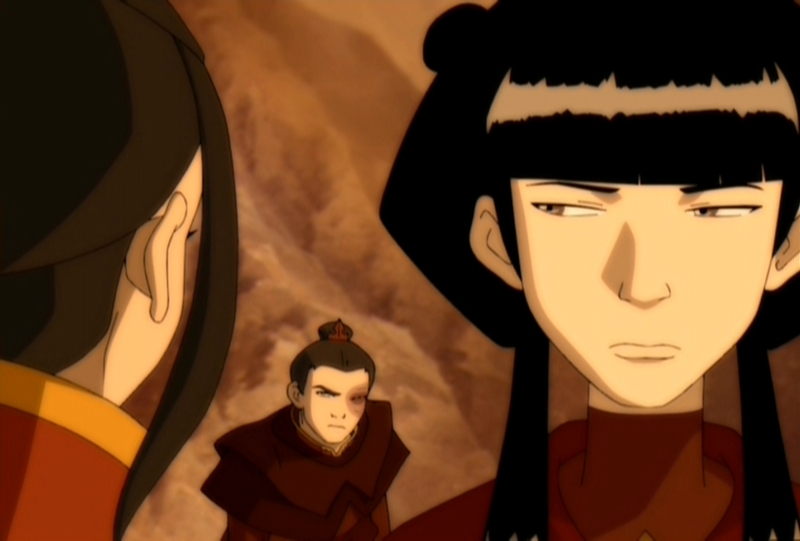 When Zuko tells her to leave them be, Azula feeds Mai a line about how Ty Lee needs help with her hair. Mai decides to “go help her” and leave the two be, but not before throwing Azula one heck of a stink eye for interrupting their romantic afternoon. Soon after, at the request of the Fire Lord himself, Azula, Ty Lee, Mai and Zuko are all sent off to Ember Island (think Hawaii) for a short vacation while their father does “important” stuff. It is here that Zuko and Mai’s relationship is finally put to the test, and as we soon learn, isn’t quite as strong as the two of them wish it would be. While attending a party and seeing another boy flirt with Mai, Zuko lets his temper get the better of him. 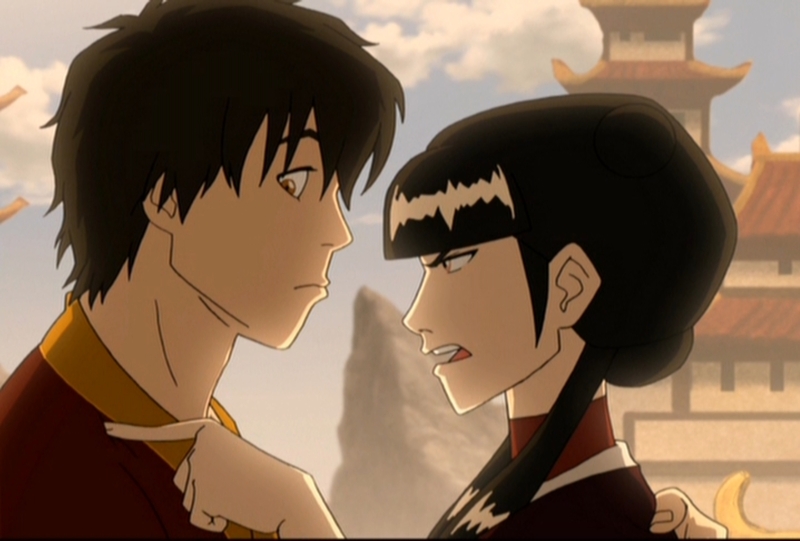 Mai didn’t flirt back, of course, but the scuffle quickly soured as Zuko let his anger get the best of him. The two part ways for a bit, eventually meeting up with Azula and Ty Lee at a bonfire on the beach. 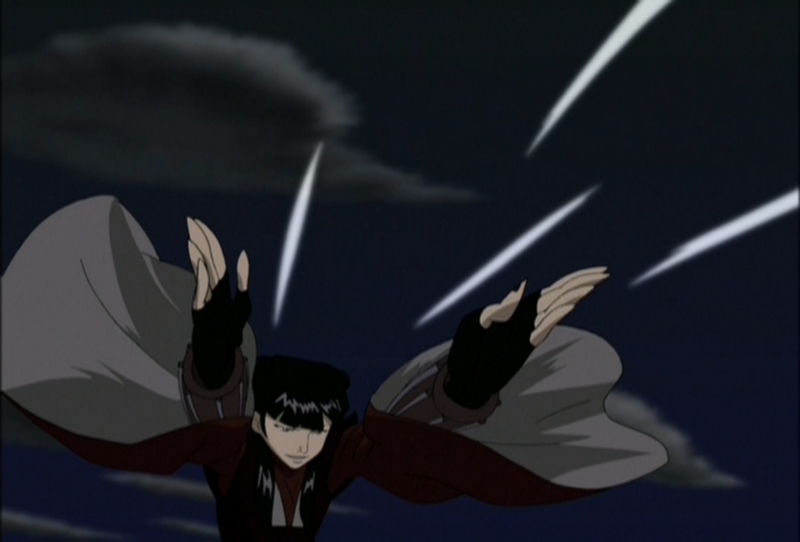 This scene is quite crucial in both the relationship between the Mai * Zuko, as well as for Zuko’s development as a character himself. At one point, after Ty Lee insults Mai’s aura by calling it stingy, Mai informs the three of them that she doesn’t believe in auras. “Yeah, you don’t believe in anything,” Zuko replies. “Oh, well I’m sorry I can’t be as high-strung and crazy as the rest of you,” Mai shoots back. “I’m sorry too!” Zuko proclaims. “I wish you would be high-strung and crazy for once, instead of keeping all your feelings bottled up inside. ” Zuko’s anger, Mai’s general lack of visible emotion… both are things that really hurt the relationship between the two. If any of you have been someone with anger issues, or someone who never expresses their love for you in a visible way, then I’m sure you can understand where these two are coming from. Despite their feelings for each other, the communication between them needs a lot of work. 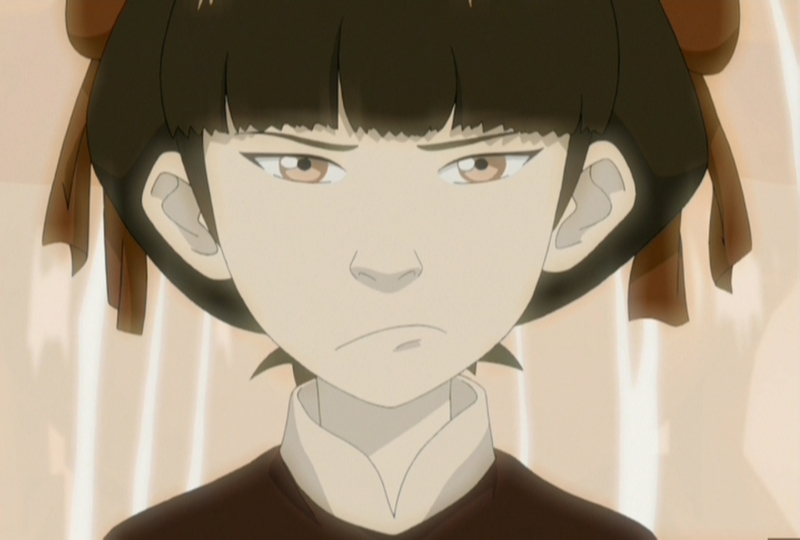 Yeah Zuko, who are you angry at? 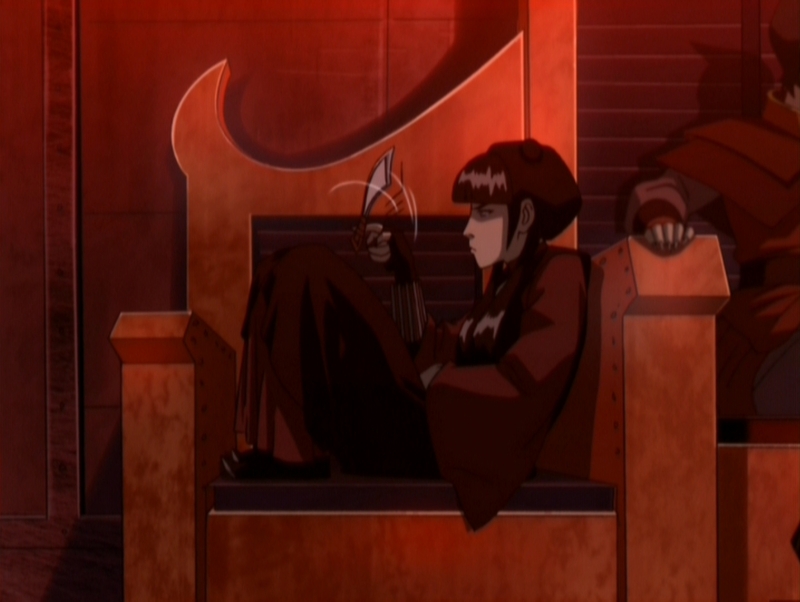 Zuko then states that he likes that side of her, and goes to sit next to Mai before being quickly reprimanded by her. 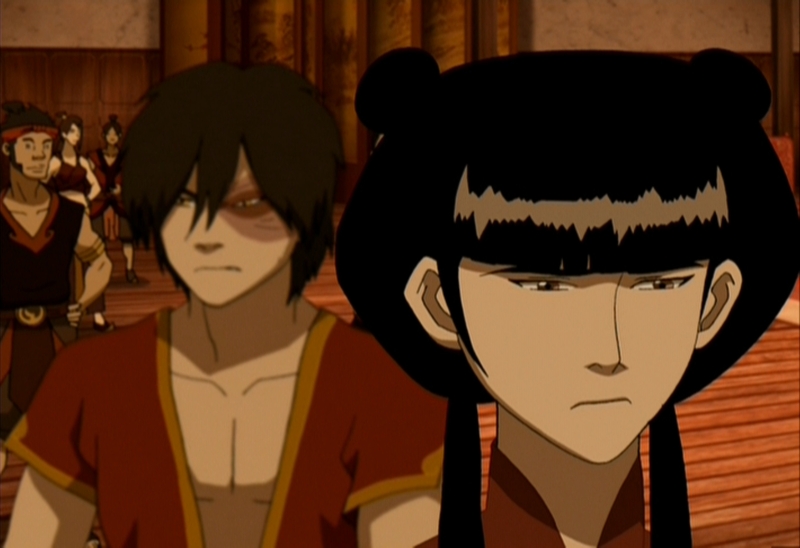 “I’m still mad at you!” This is soon followed by the three girls to questioning Zuko and his anger. Why are you mad? Who are you mad at? These are all questions that Zuko himself doesn’t seem to know the answer too. It isn’t until the girls continue press him for answers that he finally cracks, and realizes just who it is he is anger at. Zuko and Mai make up. For you see, soon after their vacation Zuko come to the conclusion that he has, in fact, made a mistake by betraying his uncle and joining the Fire Nation. A mistake he intends to fix by leaving him home and joining Aang and the rest of the Gaang to help them stop his father. Of course in order to do so, that also means he has to leave Mai behind, as he doesn’t want her to suffer any of the fall-out should he ever be punished for his (now second) betrayal of the Fire Nation. At this point in time we don’t see Mai again for a little while, as Zuko, Aang and his friends finally meet up and eventually (reluctantly for some) decide to work together. Don’t ever break up with a girl via letter. This brings us to Sokka and his quest to break Suki out of prison. What I didn’t mention in last week’s post was that during their attempt to break Suki out Zuko was discovered and captured by the prison guards. There he was placed in a cell to await the arrival of whatever punishment that would befall him. What he didn’t expect was to find Mai waiting for him, holding the letter he used to break up with her in her hands. 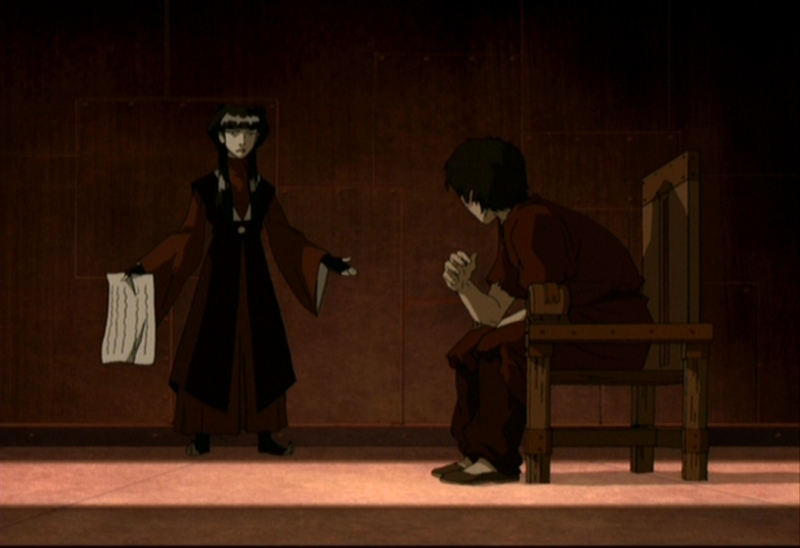 The two of them argued, Mai’s feelings having been visibly hurt by Zuko when he left. Mai didn’t understand why he would do such a thing to her, and confronted Zuko about it. Zuko admited that he didn’t want to do it, and confessed that he never meant to hurt her. He only did what he did to protect her. 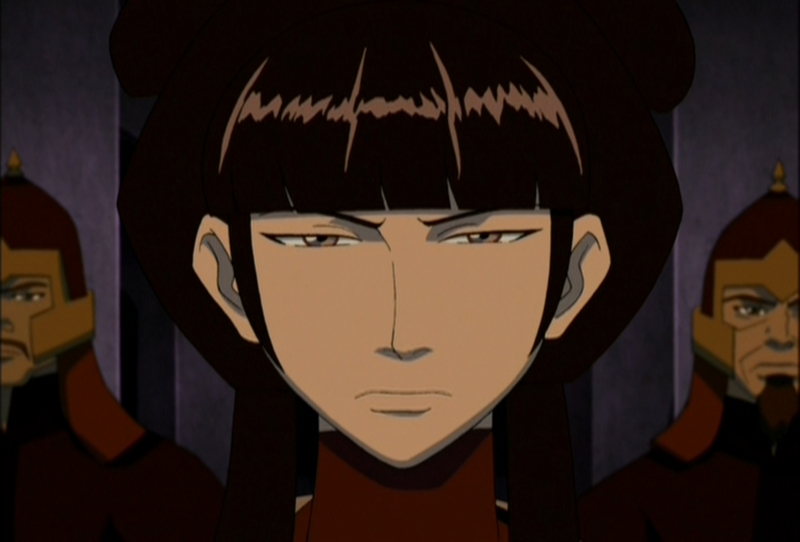 Mai didn’t seem to buy it, but was unable to resolve the issue with Zuko before a riot (caused by Sokka) broke out. 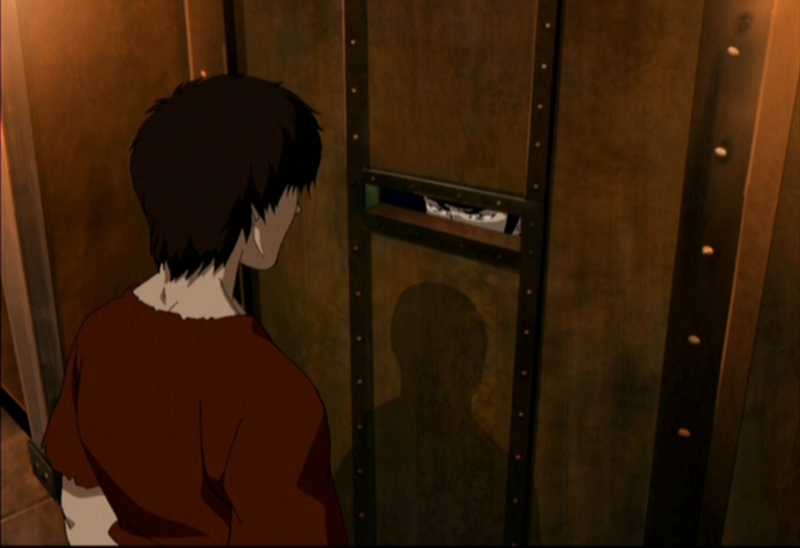 When a guard came to warn Mai and look out for her Zuko used to moment to escape, locking his ex-girlfriend in the very cell he was just thrown into. Before he left to escape though, the two shared a brief moment through the thin slot in the door of the cell. With Zuko showing genuine remorse for the way things had transpired. A lot can be said with just a glance. Zuko, Sokka, Suki and a few others eventually make their escape from the prison, but not before running afoul of Azula and Ty Lee who had traveled over to the island alongside Mai. The warden, who didn’t want his perfect record of having never let a prisoner escape to end, ordered his men to cut down the cable cars that served as the only way to and from the prison. At this point, things were looking pretty grim, as neither Zuko nor Sokka had any way to stop their eventual plummet into the lake of boiling hot water below them. Luckily for them though, Mai stopped the warden’s men, defeating about twelve guys single-handedly in order to “save the jerk who dumped her”. And upon seeing Zuko escape to freedom, allowed herself to be captured. But they were both caught off guard when Ty Lee, the one who usually did her best to keep everyone happy, intervened and chi-blocked Azula; rendering her limp and defeated on the floor. In such shock over what had just happened, Mai and Ty Lee were quickly overwhelmed by guards and brought before the now helpless Azula. When asked what should be done with them, Azula simply cried “Let them rot!” And that was the last we would see of either of them until the show finally meet its conclusion. THIS is the example of “forbidden love” I mentioned earlier, and how it was done right. Mai and Zuko may care for each other, but that doesn’t mean that they can just be together magically. They both must do what they feel is right for themselves and each other, and then live with the consequences. The lesson here, folks, is that great relationships are built by two individual people who each have their own lives. They choose to share their lives with one another and build upon each other, sure, but only once each of them has become the whole and healthy individual they need to be. Zuko had PLENTY of issues he had to work through before he and Mai could finally be happy. Oh sure, they had a wonderful “honeymoon period” when he got back to the Fire Nation, but even then Zuko was struggling with himself and unsure if he’d done the right thing. Only by leaving Mai, betraying his country and helping Aang restore balance to the world was he able to finally live with himself. Only then, after all that, was he truly able to be with Mai. As I like to say, you can’t share your life with someone else if you can’t even share it with yourself. Did Zuko want to break Mai’s heart? No. But had he not left to find balance within himself he’d have never have been able to be happy with Mai. Likewise, despite her un-emotive personality and general lack of caring about a great many things. Mai finally had to decide which battle she was actually going to fight for. This is a girl who, on countless occasions, simply let the good guys get away because she didn’t actually care about who won. Mai was never really invested in anything. But when Zuko’s life was in the balance, when she had to decide between saving him at the potential cost of her own life and living a life without him, she chose to fight for him and sacrifice herself. It might have taken her two seasons, but she finally found something worth fighting for. That’s something we all need to have in our lives. Well, I’m sort of curious as to why you did this…. And, like any good report, I think you need more commentary. Why do you think these two go so well together, do you find that in the comic books (Promise series) they are having uncharacteristic problems, what do you foresee relationship-wise will happen, is there some kind of hidden message in the new installment? I actually really enjoyed The Promise! So much so that I plan on doing a full write up/review at some point here (hopefully when I can find a way to get some good quality pictures for it). 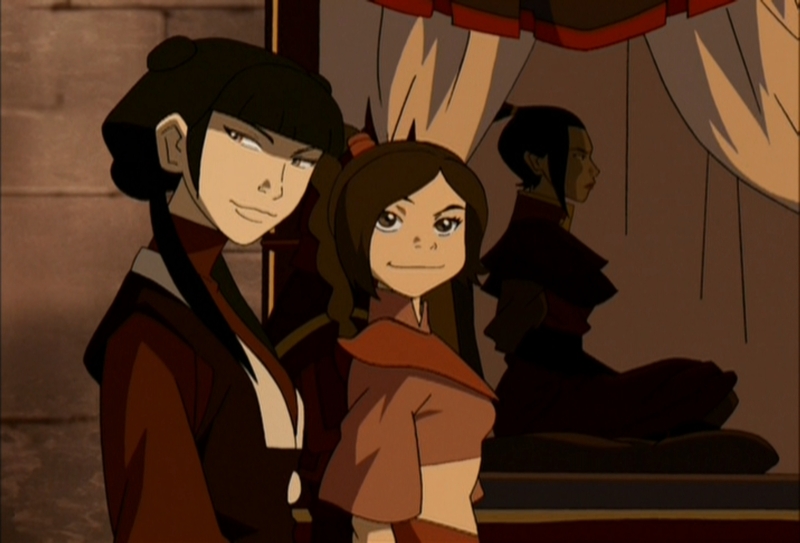 As for Zuko and Mai’s relationship in the book, I was both disappointed in the lack of “screen” time they got while also understanding that the story wasn’t about them. 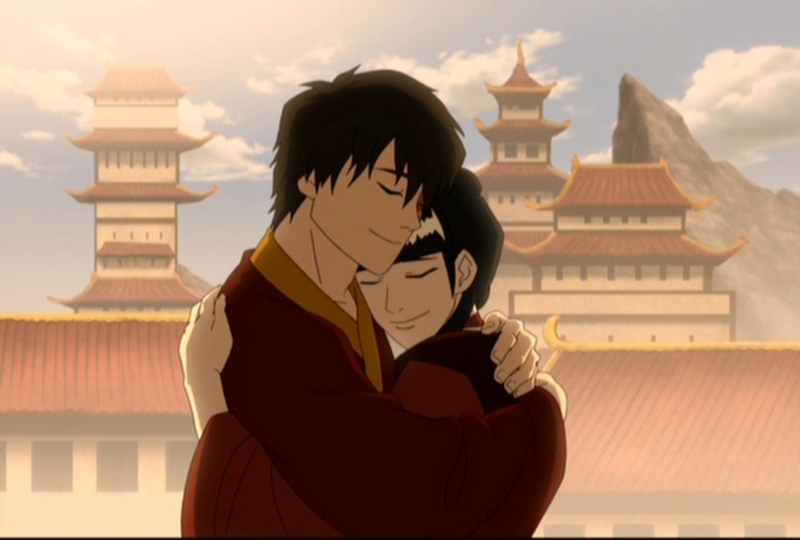 I too hope they get back together soon, and have hopes that the next series of comics (which will focus on Zuko searching for his mother with Azula’s help) will see the two of them reunited. Since the story is a bit more of a personal one, there is certainly the possibility that in finding out what happened to his mother, Zuko realizes just how important and special Mai was to him. Because as it stands now, all Zuko’s done is ignore her and push her aside like he did in the past. He needs to learn how to balance being Fire Lord and having a family/relationship. Which is something that we have yet to see any of the characters really struggle with yet. (Although there are hints of it with Katara in The Promise). I hate Mai. I didn’t even want her to be with Zuko. It was a huge disappoiment that they were a couple, even for a little while. Actually, I didn’t want Zuko to end with no one. He has been kissed by Jin in Ban Sing Se and I was really sad, but when I understood that the creators were going to put him whith Mai, who is an awful person, I changed my mind about Avatar The Last Airbender. I HATE HER SO MUCH AND I HATE THE FACT THAT THOSE CREATORS MADE ZUKO TO BE LIKE HE LIKED AND ‘LOVED’ HER. Stupid things. Indeed. So disappointing. And Avatar is not an anime. Are Zuko and Mai at the end together? Does Zuko at the end really love Mai? They are my favorite characters. And I don’t want that they doesn’t be together. I have to say I’m with you. I think a couple as two individuals that decide to share their lives together, cooperate and encourage each other to be better persons. We saw that in Aang and Katara’s relationship and Sokka and Suki. But Mai, she has that lack of empathy and that… meaningless attitude. She didn’t even care about her little brother’s life when they would exchange him for the king Bumi. That makes me feel so sad for Zuko. He has a beautiful soul and I think he could find someone else that brings that to his life. I think this is a great article. 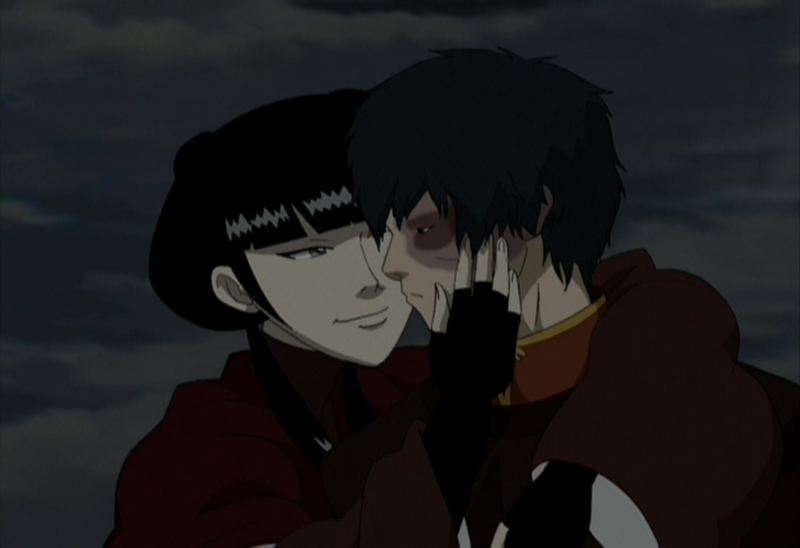 Zuko and Mai (from Avatar: The Last Airbender) are a great couple to learn something from. They MADE it work. We can too. 🙂 We can choose love over bitterness and hate. We can choose forgiveness over condemnation. We have the power to make or break all of our relationships. Choose love. It’s always better in the end….